It is a cold 10 degrees right now where we are. Our kitty has been let back in the house to stay warm. My fingers are cold as I type this! We are trying to save money by keeping the thermostat down to 55. At nighttime it goes up to 65 though, as little babies aren't very good at keeping blankets on :) . Our bedroom is the coldest room in the house as it is always kind of shaded, there is a crack in one of the windows (only through one panel), and a missing panel of glass on one of the other ones. It is still much warmer than outside, for which I am thankful. We will hopefully be able to replace a few of the windows in our house in the coming months during tax season. I do not have batteries for our camera right now, but I did get to take a few pictures at Thanksgiving time that I wanted to finally share with you. On Thanksgiving Husband had to work. 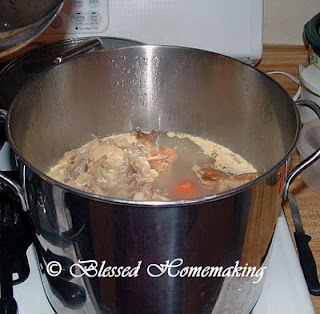 However he said to go ahead and put the Thanksgiving meal together whenever I wanted to. So I decided to do it on Thanksgiving Day so the children could enjoy the highly anticipated meal. Husband was happy to have some the next day. I did not get a picture of all the food I made, but just a few things. I hope you enjoy these. 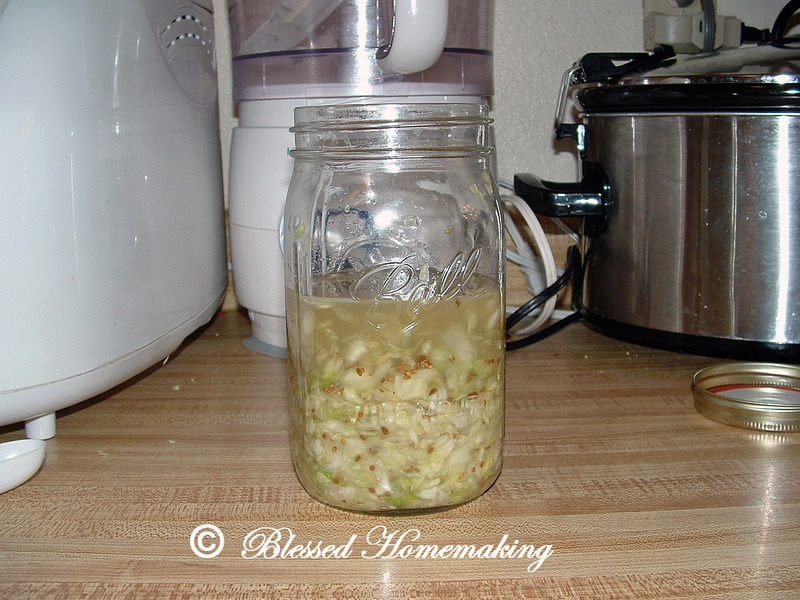 Here is one of the jars of sauerkraut, getting ready to ferment. 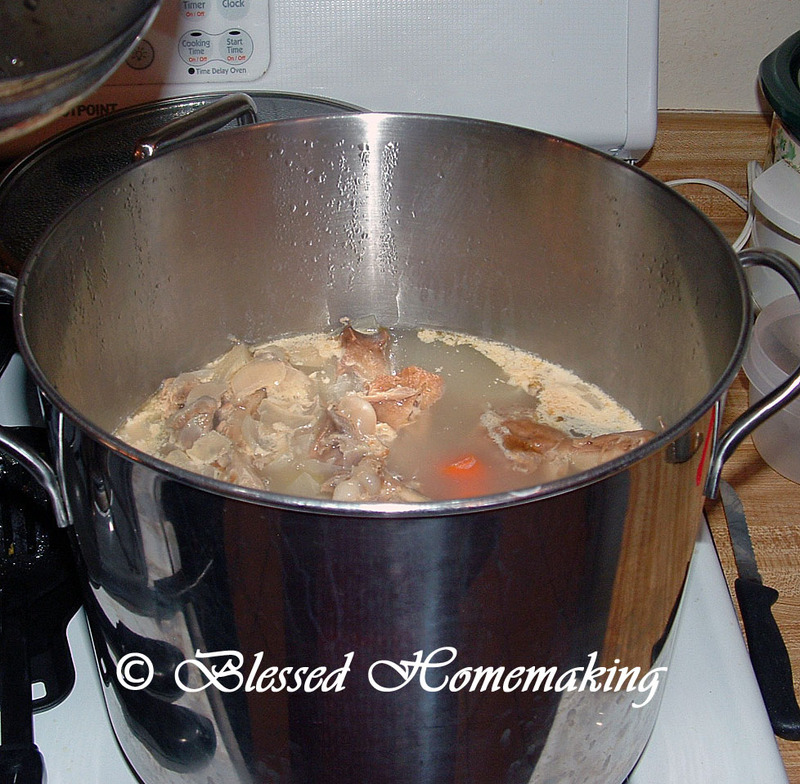 Here is my turkey stock cooking, in its early stages. Sorry that's all I have, and not any more! Thanks, Tami! I wish I'd gotten pics of all the food. Oh yes, we were not complaining that he worked, not at all. Pictures of home, pictures of Life, Pictures of Love. I just wanted to say that I enjoyed your picture of your daughter helping you in the kitchen. She looks quite happy. :) I'm sure the food you made for Thanksgiving was good too. The soup is just perfect winter fare!